Today, for Studio Monday, I'm happy to present my latest mixed media canvas called "Bring on the Wonder". It's so bright and fun, I am really happy with how it came out. I've also gotten a wonderful response by the lovely people that "like" my Facebook page, I'm overwhelmed, truly. I can't thank everyone enough for commenting. 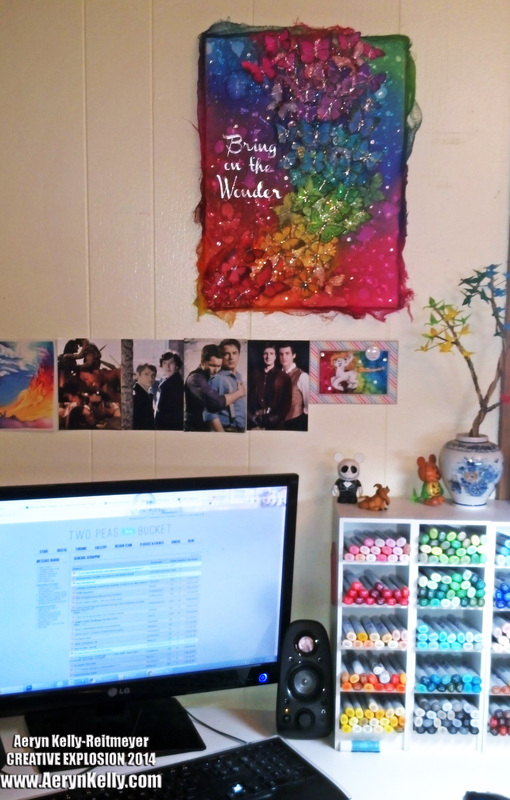 This was just an experimentation, a need for something rainbow in my space, and it turned out prettier than I hoped. Several of the responses I got asked how I made the piece and for a step-by-step. While I didn't take a ton of pictures during the making of this (and a few got deleted), I have some to share with you today. This first photo is something I took when I was asked to share a "peek" of what I was working on when I spoke of a rainbow canvas a month or so back. 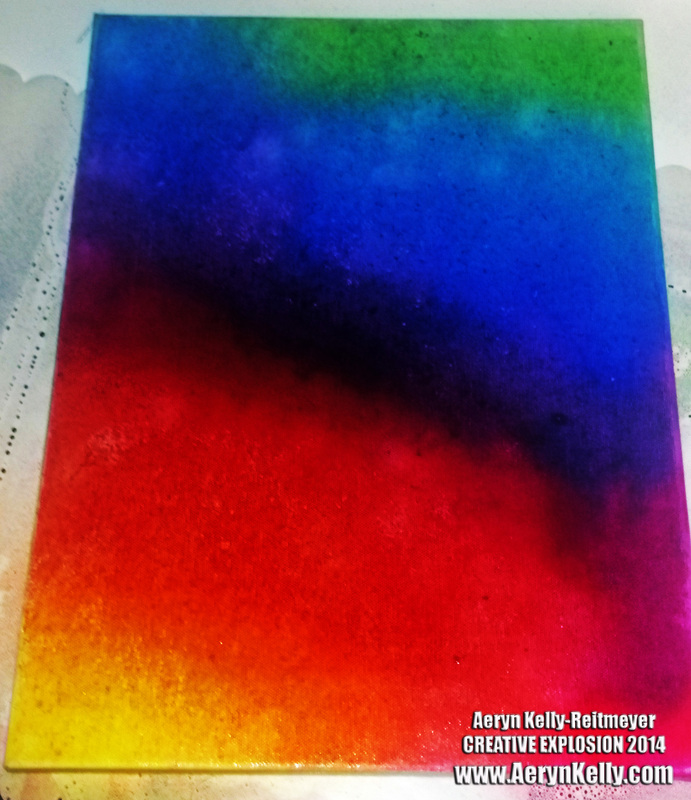 This canvas is 12x15 inches and getting a rainbow blend was a *lot* of trial and error. There are several watercolour paper sheets that I just plain threw out because they didn't work out. In this picture, the canvas is in the process of drying. When it dried, I went after it with water. I misted, I dripped, I just plain threw water at it. This is after I the water dried and I finally thought of a direction or idea for the canvas. I went online, searched out free butterfly clipart, and printed out several sizes and variations. I was auditioning how I wanted the butterflies to fly and what size I wanted them. Once I'd coloured many, many of them I also auditioned, in this manner, how I wanted the colours to flow. Originally I had the colourway following the background. 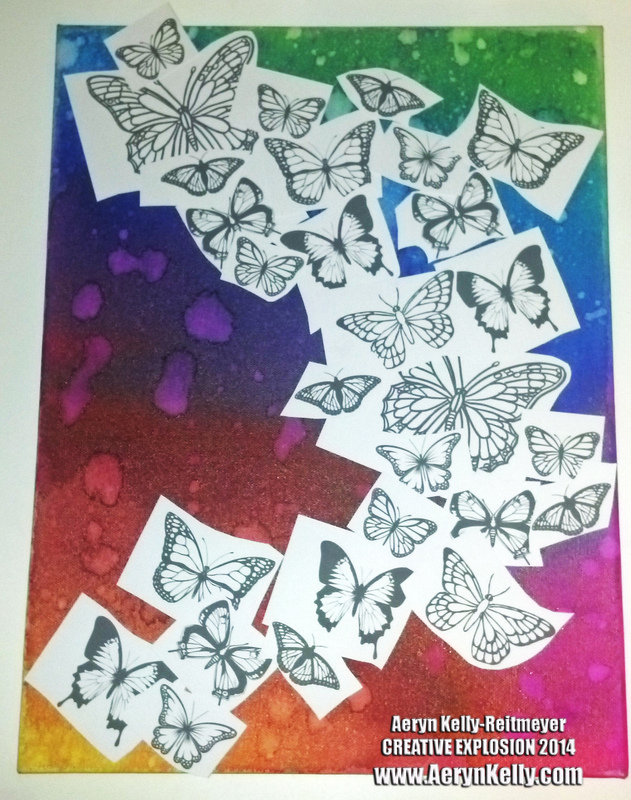 Then I had the rainbow going down from the top, but finally decided on the rainbow flying upwards so that the colours of the butterflies would match up with their complimentary colours in the background. Originally I started colouring the butterflies with my Copics, but that was desperately and intensely boring. I mean, mind numbing to the point where I just kept putting it off. Now, I think, it was so hard because I was going in the wrong direction. I got the idea that I would use my Derwent Inktense pencils instead and it when like lightning. The video game that Mike and I are into got an update on Thursday and kinda broke for a while, so we didn't play. I got all the butterflies coloured and re-coloured just in that day because the game was off, lol! This is the stage where I went through and added more Stickles than ever known to God and man. I mean, this thing is SO shiny its ridiculous! 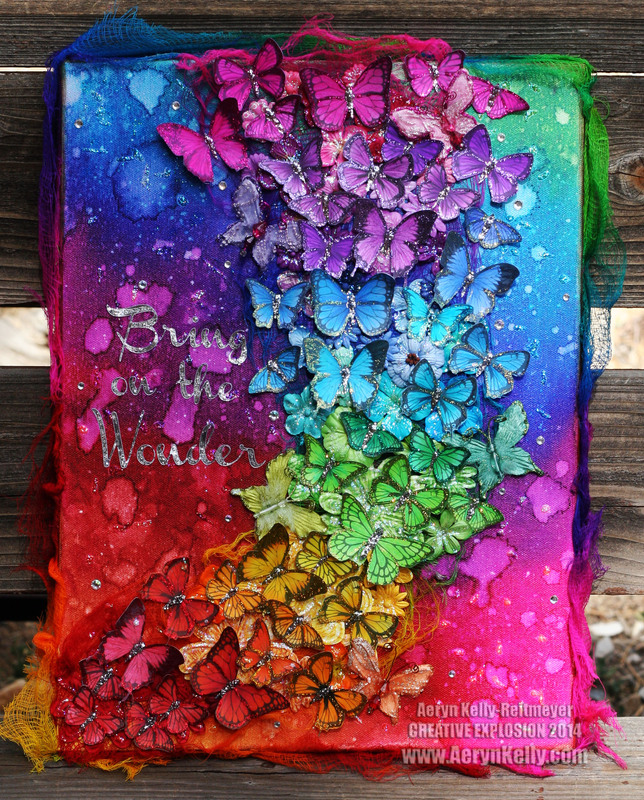 I don't know if I was covering up the black of the butterflies not printing great, or trying to add interest to the butterflies, but it seems to have worked out. 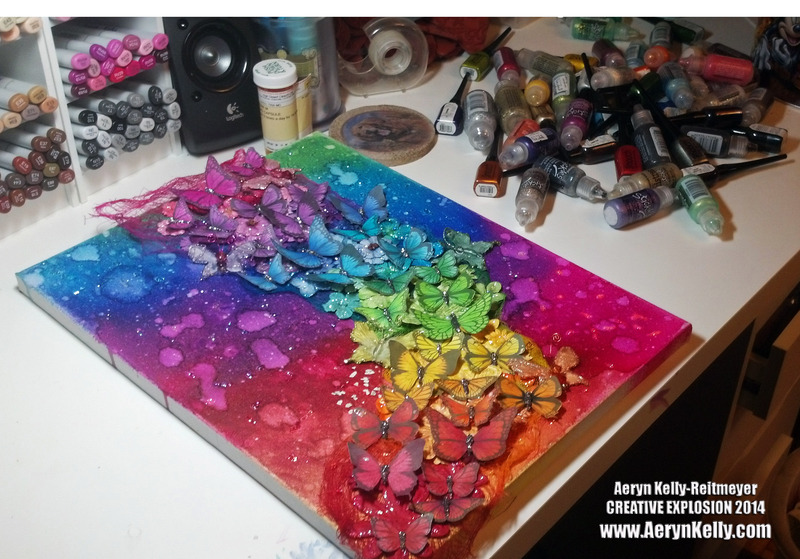 I used the large Ice Stickles for the butterfly bodies and then tried to coordinate the colour of the butterflies with Stickle colour. I didn't have the proper blue, so those butterflies just have very light blue on them. This stage took a while, and then it was a matter of making sure not to touch it for a long, long while. And the final photo for you is the piece up on my wall. I put it over to the right because I'm developing a companion piece for this. I just don't have the proper size canvas on hand. 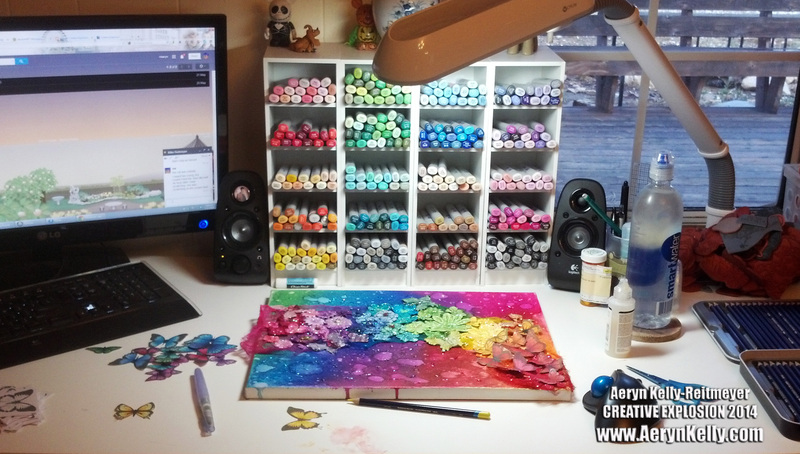 I hope you enjoyed this canvas, the little peek at how I made it, and this edition of Studio Monday. Thank you for coming, and I look forward to seeing you again! Thanks, Valerie. Yeah, I think colour begets colour, you know? Thank you! I'm glad you enjoy it. I had to take it outside to capture just how shiny it is! this is just so whoa! i love it. pinned it for later too! you rock! Aww, thank you! I appreciate the pin too. I'm so happy you like it! Wow! This is absolutely stunning! I Love it! Definitely pinning!